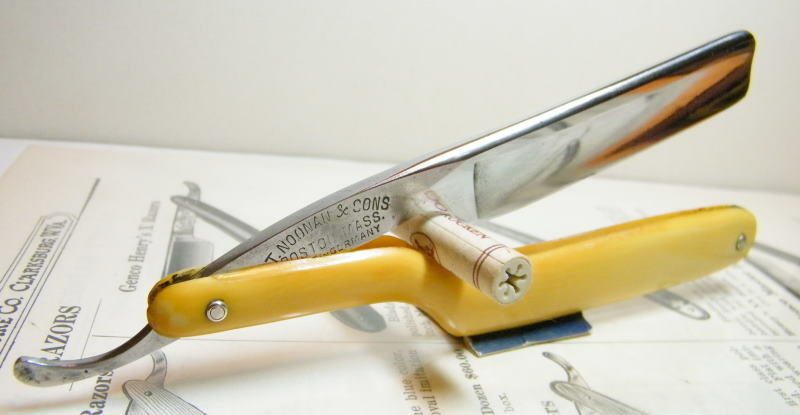 STRAZORS.com - all about classic razors - ZEPP, T. Noonan & Sons, Boston, Mass., Made in Germany. 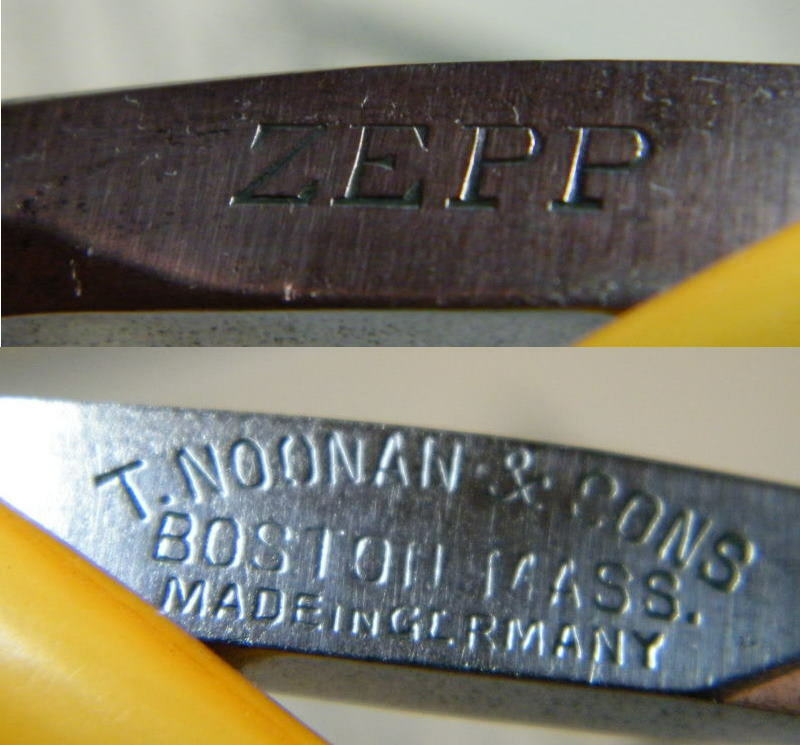 ZEPP, T. Noonan & Sons, Boston, Mass., Made in Germany. Timothy Noonan was a Boston Hairdresser from 1871 through 1880. At that time his address was on Washington Street: at 723, then 913, and 910. From 1871 through 1873, he was listed as Hairdresser & Saloon. Some time after 1880, the company became known as "T. Noonan & Sons". Since 1901, it was T. Noonan & Sons Company of 38 Portland Street, Boston, Massachusetts. In 1920, Frank M. Noonan (founder's son), registered the trademark "Zepp's", and claimed to have been using it since 1876. The advertisement in the Barber's Journal from May, 1925, was places by the Union Cutlery Co. of Olean. The advertisement contains a complimentary statement by Mr. Noonan about Union Cutlery Co. razors. The ad copy refers to T. Noonan & Sons Co. as one of the largest, oldest, and most reliable establishments of the country. T. Noonan & Sons Co. also had razors marked with their own name: "Copperdine", "Case Red Imp", "ZEPP", "Velvo", "Minute Man". T. Noonan & Sons Co. ordered razors in Germany. 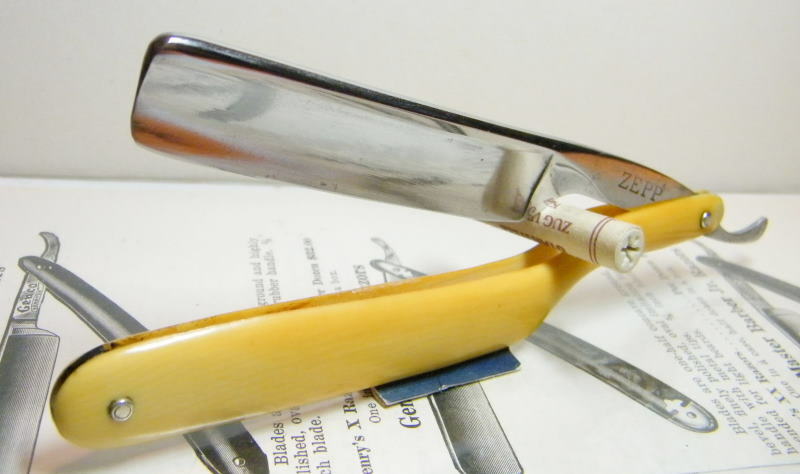 Most likely, razors for them were made by Carl Friedrich Ern, also the owner of ZEPP trademark. The blade is 5/8, square point, 1/2 hollow ground. The price includes delivery worldwide. PayPal Only, no eChecks, please.